We all may have toxic people in our lives. Sometimes these toxic people are close and personal and sometimes it may be someone outside of your close network. The toxic person at work or the random person on the street should be easy to deal with because you can ignore them. At the very least, you don't have to take them home with you. These individuals should take the least out of you emotionally, though this may not always be the case. You may have to deal with them on a professional level; however, you definitely don't have to deal with them beyond of that. You don’t have to go to lunch with them or have personal conversations with them. Let’s discuss the random person on the street with whom you come in contact. You may run into a random worker at the drive-thru has an attitude with you for no apparent reason. Perhaps they were having a bad morning and it felt justified to take their frustrations out on another random person, i.e. you. One person makes you feel responsible for their hurt, guilt, frustration or whatever is going on with them. Now, here you are pulling off out the drive-thru and yelling at the person who accidentally cut you off on the road. When you get to work someone inadvertently does not smile at you or say good morning and you internalize the behavior, “he’ll know the next I speak to him”. Your boss calls you in the office. Before the boss can tell you why your presence is needed, you say to your co-worker, “I can’t stand her, she is always calling me in the office for little or nothing”. The boss tells you what she wanted, it was not serious; however, you barely listened because you are still frustrated from the interactions of the morning. Then you go home, when you partner asks how your day went, you tell him all about the awful people you had to deal with throughout the day. He responds by saying, “did you remember to pay the electric bill”. You snap, “what do you mean, you never listen to anything I say, you don’t care one bit about me”. Now your husband is upset but he says nothing in response. Your son runs by your partner, slightly brushing him while he is cooking and your partner shouts, “Didn’t I tell you to never run in the kitchen, especially when I am cooking. What’s wrong with you”. Now little Johnnie thinks something is wrong with him because he cannot remember not to run in the kitchen. Little Johnnie also gets his feelings hurt because he doesn’t like when his dad is angry with him. Then you yell at your partner for yelling. Get the picture. There were six people emotionally injured in one day and it begun with one person. As humans beings we feed off of one another and are deeply impacted by each other. Toxic people do rub off on other people. The problem is we often believe we are unaffected. You are human and you have feelings and when your feelings are hurt you tend to do one or more of these things: you strike out, you emotionally cutoff, you cutout, you internalize or your do a combination of one or more. When someone strikes out at another person it is usually a result of some hurt or perceived hurt. You can knowingly or unknowingly strike out at someone else; however, it usually is not at the person who struck out at you. This is known as projected anger or misdirected anger. This is a maladaptive, even destructive way of coping. Many tend to strike out when they have not learned how to effectively communicate their needs, wants, or problems to others. When you emotionally cutoff you decide you will not deal with the person emotionally. This means any dealings with that person becomes superficial, phony, distant, eventually non-existent. You emotionally cutoff from your partner after all the yelling to avoid more yelling, to sulk, to regroup, to avoid more angry feelings. Emotional cutoff can be a coping mechanism needed, in the moment, to take care of yourself and others. However, when this is the main go to in an intimate or other close relationships it can start to become a detriment. It shows an inability to effectively communicate. If you are able to cutoff for short periods of time, regroup, and then come back to discuss the issue then emotional cutoffs are not all bad. However, some people live here-they emotionally cutoff a lot of people all the time. This shows a lack of trust in others and is an indication of a person who has been hurt often or perceives hurt where there may be none. In the scenario above, if the wife was to come home often and take her frustrations out on the husband the husband would soon shut down and not ever ask about her day. The wife might then think he is so selfish all he ever talks about is his own day. Now both people are only dealing with each regarding necessary things until that too becomes too difficult to talk about. Emotional cutoff can be helpful and necessary at times but it can also be a relationship killer. When you cutout, which usually comes from a deep hurt, you no longer deal with that person at all. You don’t speak, you don’t call, you avoid them at all cost. Emotional cutoff can end with someone cutting out. Cutout can also be abrupt and come from a hurt that is not able to be forgiven. Cutout is also a very necessary coping mechanism which we use in order to keep ourselves physically, emotionally, and mentally safe. In instances of abuse the victim should cutout. Internalization is also from being hurt by someone; however, individuals who internalize usually turn the hurt inward. They begin to blame themselves for the things others do. People who strike out never think they are the problem but people who internalize always think they are the problem. When you internalize it is you attacking you, blaming you, and shaming yourself. Internalization is a non-productive coping mechanism. It is self-destructive. It is a way of not dealing with the problem and making yourself the problem. Little Johnnie who has no voice is likely to internalize because he has no words or understaning of why his dad was so upset with him. Though he knows it is wrong to run in the kitchen he still cannot understand the reaction from his dad, sense the behavior did not require the level of reaction he received. When the wife comes home and strikes out at the dad he may be able to intellectualize the situation by saying to himself or out loud, “don’t take it out of me, just because you had a bad day”. However, a child is less likely to be able to intellectualize something to that degree. Internalizers are at risk for depression, suicidality, drug use, promiscuity, self-loathing, and/or self-hatred and other disordered thinking and behavior. You must first understand there is a cycle or there is the possibility of starting a cycle. I began the article by saying random people and people at work should affect you the least. Why do I say that when it often is not the case? The key word is should. In the above scenario the cycle began with the worker at the drive-thru. If in that moment of feeling disrepected, hurt or frustrated about how you were treated by this person you were able to say, “um, they must be having a bad morning, something I did not contribute to”, it would immediately put the transaction into perspective. When someone strikes out at you and you knowingly have done nothing to contribute to the strike out understand this is an opportunity for you to stop a perceived cycle. Think the situation through, to yourself or outloud, if need be. Often it is not wise to get into a stand off with random people; there is usually no benefit to it, even when you perceive yourself to be “right”. We often put more importance on being right than living right. It may take practice but learn to think it through. Some of things you can ask yourself is: “did I do anything to warrant that?” If the answer is no, then understand the issue is with the other person. Then you say to yourself, “since I did nothing to warrant this behavior or reaction, I can feel good about myself. She must be having a bad day and I will not allow my day to be altered by it”. When you make yourself aware of an unpleasant transacton between you and someone else you now have an opportunity to not only choose how you will respond, you can choose if you will respond, or you can choose how the rest of your day will be. You can try to talk air differences with the person. Again, this is not recommended for the random persons on the street; however, you may want to use it with co-workers or other people who are not random, including intimate partners. If you are the person receiving unprovoked anger, frustration, or discontent from someone else you can pull them aside and ask how they are doing. Don’t ask them why they said or did what they did, it will just create a hostile situation. However, it will totally throw them off guard when you ask how their day is going, right after they strike out at you. The person may break down and tell you what a rough day they are having. They may even apologize for the way they were acting because you indirectly addressed their behavior in a non-threatening way. It may also work if you wait until the person has cooled off, “Jane, I noticed you appeared to be upset with me earlier, is everything okay between us” They may not remember an earlier incident, sometimes people will move on especially if you weren’t the person they were really angry with. Don’t be offended, being offended means you are making it about you. Remember, if you did not to contribute to the hostility then it is not about you. If you choose to address it; it’s always best to do it in the moment in a non-threatening way. Even if the person says leave me alone, they have been made aware of their behavior. They may come back later when they are ready to talk; if they feel it will be received, so be open. Don’t blame yourself, fault others for someone else’s bad behavior, or internalize someone else’s bad behavior. Often internalizing can be stored material. Either I will take it out on myself later or I will let it out on someone else later (strike out). If you played a role in the interaction accept your role. Relationships are a two way street so rarely is one person totally responsible for a negative interaction; though it does happen. When you know you played a role, own it, apologize if necessary. Apologies go such a long way; yet, it is something that is not done enough. Especially, in intimate relationships. It is often assumed, “they love me, they know I’m sorry”. Those things may be true; however, everyone loves an apology, it is the easiest way to make amends. If you are one to buy your partner gifts when you mess up, save your money, just say you are sorry. Make sure you mean it and can explain why you are sorry. Try doing a random act of kindness. You could make someone have a great day who was otherwise NOT having a good day. You could advert a negative transaction without ever knowing it. If you had a negative interaction with someone turn and around and do a random act of kindness to disrupt the negative cycle. Doing something kind is as impactful and cyclical as a toxic interaction. Which would you prefer? Use emotional cutoff and cutouts sparingly. If it is a matter of keeping yourself physically safe, emotionally healthy, and protecting others who need protecting, such as your children, then by all means you should emotionally cutoff or physically cut out. Otherwise, try not use make cutoffs and cutouts a habit. Toxic people may warrant a cutoff or cutout; however, it does not mean that every time someone hurts you in some minor way you need to cut them out of your life or out of your support circle. As you get older your support circle naturally gets smaller for many reasons. 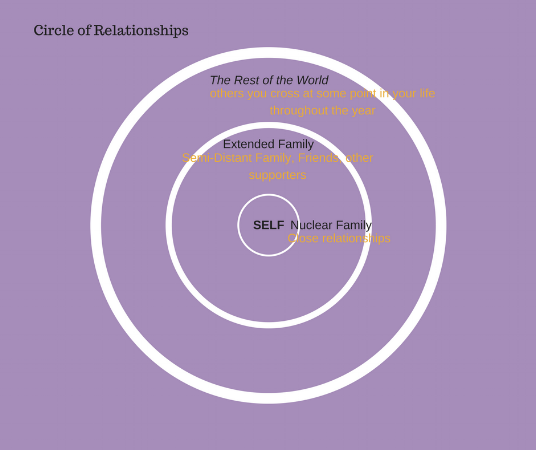 If you, at will, without justification, cutoff or cutout, you will find you have no support circle. The cycle could start with you or the cycle can end with you. Remember we affect each other both positively and negatively. We cannot live in this world alone. Finding positive ways of coping will do you good, all the people around you will benefit and the next generation will benefit as well. The cycle can end with you.